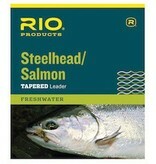 RIO's Steelhead/Salmon leaders are designed and built to match the needs of the steelhead and salmon fly fisher. The leaders are made of a medium stiff nylon and have a powerful taper design that easily turn over larger flies, and cope with tough winds. The copolymer material is incredibly tough and highly abrasion resistant.